This micrograph shows part of the stele in detail. Note the thin bands of phloem, in which a one-cell wide strand of sieve cells, (SS, with clear lumina) surrounded by darkly-stained parenchyma and albuminous cells is present between the xylem strands. The central row of sieve cells, which are surrounded by darkly-staining albuminous cells. 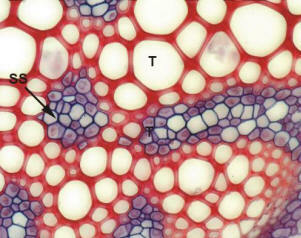 The xylem is composed of tracheids (T) of variable width - between 2 to about 8 µm in diameter.